It is perhaps not surprising that Max Born's legacy institute, has provided empirical evidence pertaining to the Random Q-event vs. Determinate Q-event discussion... which the mathematician Max Born and the logician Albert Einstein had left unresolved. However... the implications of Eichmann's work may surprise many... and the significance to theoretical physics should not be overlooked. 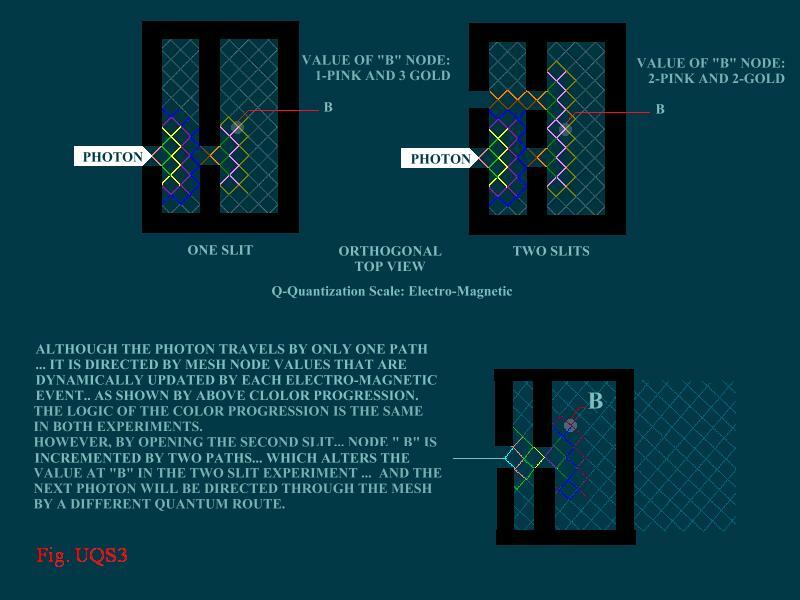 In that precision laser alignment allows manipulation of quantum path decisions within a defined spatial geometry... Einstein was correct in maintaining that quantum events are determinate. Imagine an entity in a volume of space... for example a dodecahedron. This dodecahedron is divided using a uniform unit of volume... for example a quadhedron... creating a volumetric matrices. Also imagine that the entity can only move on the lines of the spatial geometry that quantize the volumetric grid/matrices.... from one intersection to the next. At each intersection/decision... the next move of the entity is determined by the information state of the intersection. If the entity is only discernable using the most advanced laser optics... and the unit quantization scale of the grid... i.e. resolution of the coordinate system path dictates... is smaller than the entity... not only is the grid invisible to our optics... the volumetric quantization unit... the quadhedron in our example... can not be determined by observations of entity trajectories. Nonetheless... empirical observations can confirm or refute whether an existing/proposed theoretical coordinate geometry corresponds to empirical observations. Undoubtedly... "steering" atoms and controlling atom interaction... has intriguing implications for a wide spectrum of applications. However... as higher visual resolution of particle trajectories expose the existence of an underlying system of energy path dictates... the potential theoretical implications are equally significant... and more than justify a re-analysis of A. Einstein's essay "On Generalized Theory of Gravitation". In this essay... Einstein admits an inability to resolve mathematical incongruencies in the "theory under consideration"... but he correctly identifies these as inherent in mathematical discrepancies between real world energy path dictates and the cartesian/polar coordinate system from which the relativistic differential equations are derived. But in his final analysis... his only satisfaction was in having "succeeded in formulating a meaningful and precise question". The Albert Einstein legacy question being: "What is the mathematical character of the universe?" 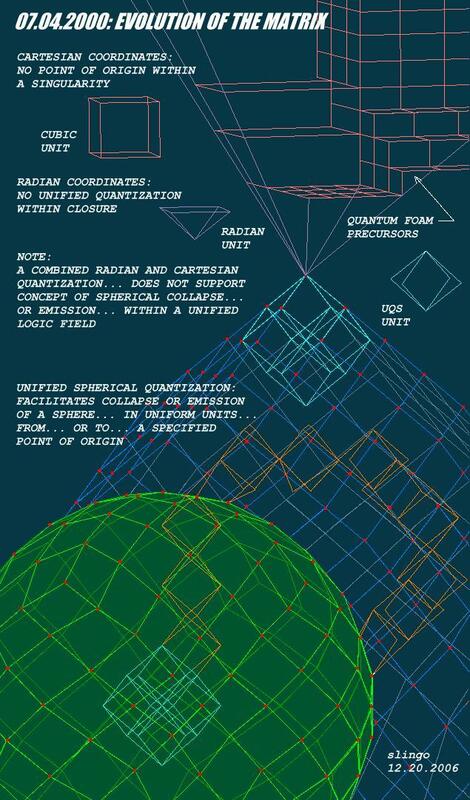 Under theoretical scrutiny since achieving singularity closure and coordinate expansion in July of 2000... the Unified Quantization of a Sphere (UQS) coordinate system... Fig.UQS1 ...has been shown to satisfy Einstein's criteria for a valid quantum geometry... and begs for empirical analysis. By representing mass as singularities within the field... Einstein could assume "the material particle had no fundamental concept in a field theory". 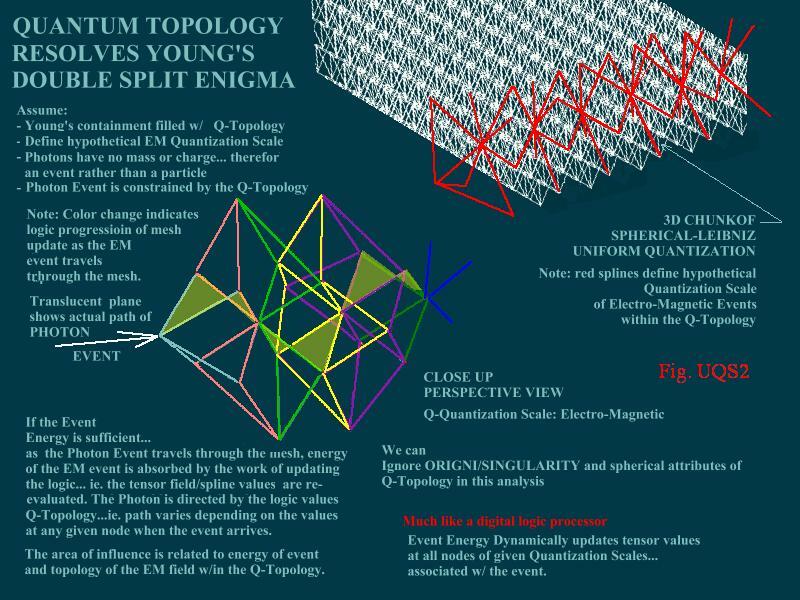 Mass entities are comprised of multiple energy events... but UQS supports the tensile symmetry mathematics required to represent mass as singularities... at quantization scales utilized by mass energy events in the path dictate geometry. The UQS coordinate geometry has an 8-bit intersection/node. As energy arrives at an event intersection/decision in the path dictate geometry... the path the energy will take is determined by the 8-bit information state of the UQS coordinate intersection/decision... and the info variables are updated as the event "fires" and the energy passes through the intersection. In that R. Feynman declared YOung's Double Slit Experiment as "the essential mystery of quantum mechanics"... UQS was developed in part... as an attempt to determine a volumetric geometry and associated intersection event information state transforms... that would provide path dictates... for a digital simulation of the photon in Young's experiment... and yield the same results as the empirical experiment. Inherently free of quantum foam infinities and N-Dimensional issues... which have for more than 50 years... discredited theoretical physics with it's empirical peer... the UQS coordinate system and associated event information transforms... appear reasonable from a logic stand point. Of course this does not prove UQS corresponds to the abundance of empirical data. Although overshadowed by a market driven quest for application research... given the potential of a valid quantum geometry to facilitate navigational aides for "steering" atoms, detecting sub-atomic events, and making Planck to sub-Planck transitions... opportunities for empirical analysis of reasonable candidates... should not be ignored as a priority. If in the Q-random vs. Q-determinate discussion... Born advocates can visualize a volume quantized by a uniform unit of volume... defining a coordinate geometry for energy path dictates...in which the quantum energy path is determined based on the information state at any given intersection/decision of the geometry... and the information state probability is based on the number of intersection variables to the power of that number... then the perception of mathematician and logician can be reconciled. This would be good. Theorticians... many disguised as science fiction writers and/or computer geeks... could benefit from the mathematicians' insight on initial state and reentrant circuits... which are way overdue for scientific analysis.